The WATTS ACV Two Way Flow Altitude Valve with Solenoid Override Feature is designed to open, allowing flow into a reservoir or elevated storage tank (tank fill), and close drip tight when high water level is achieved or as commanded by the Solenoid Pilot. 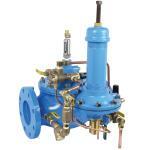 The valve also opens allowing return flow (tank discharge), when upstream pressure falls below reservoir head pressure. It controls water level by remotely sensing static tank head pressure through a field installed sensing line, and opens when the level is below the adjustable setpoint and closes drip tight when the level is above the adjustable setpoint, or as commanded by the Solenoid Pilot. The Solenoid also has provisions for manual operation in the event of power outage.